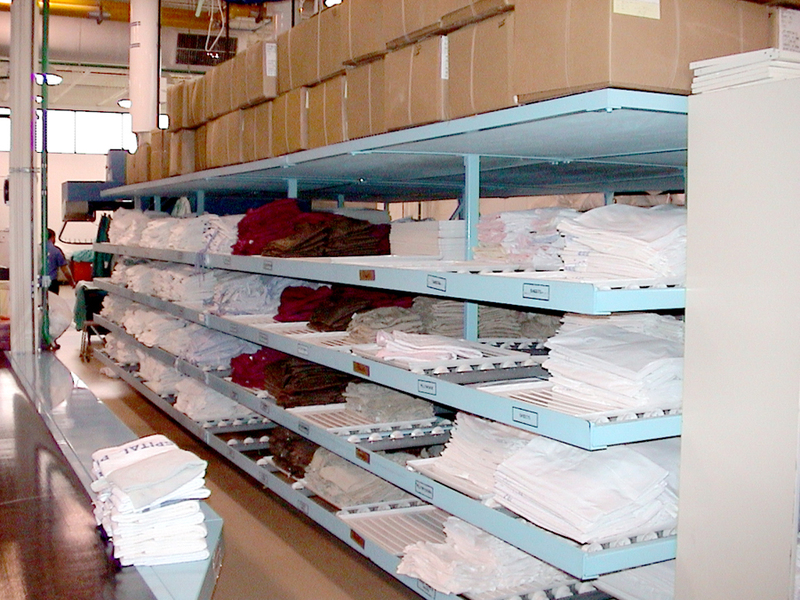 The Gardner Flow Rack is an example of systematized accumulation and conveyance. It utilizes the principal of “first in/first out.” It maximizes storage of linens in a minimum of space and segregates the linen into categories (sheets, pillowcases, gowns, towels, washcloths, blankets, etc.). The total Flow Rack concept begins with all finished work moving from finishing equipment onto a belt conveyor and being transported to the Flow Rack. As items move to the Flow Rack, they are picked up by an operator and stacked, by category, on pallets at the “feed end” of the Flow Rack. Once a pallet has reached the desired capacity, it is given a slight push, and it travels toward the delivery end of the rack by gravity, accumulating in that specific lane. In effective cart exchange systems, volumes of different categories of materials are necessary to make up carts. The Flow Rack concept allows large volumes of the same category to be stored along a lane and different categories of laundered materials to be stored in adjacent lanes, meeting volume and category requirements in a minimum of space. The make-up cart need not be moved during the filling process since all required items are in short reach of the operator. Additionally, the first laundered materials entering the Flow Rack are also the first laundered materials exiting the Flow Rack, providing consistent shelf life to these materials. Pallets have been especially designed for use on the Flow Rack and are molded of high impact ABS indestructible, lightweight plastic. The smooth surface and rounded corners resist the accumulation of foreign matter and contribute to the ease with which the pallets may be cleaned. A minimum of space is required for stacking since they are nested. There is a return lane for accumulating empty pallets for gravity return to the feed end of the Flow Rack.